ALL NEW & IMPROVED in 2014! 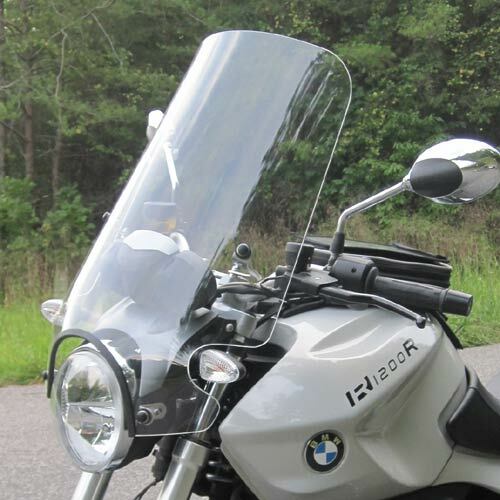 In 2014 we upgraded the Parabellum R1200R Sport Shield with so many improvements that it is an entirely new design. Significant changes are the improved curvature and shape which increases stability and protection. The Parabellum windshield is made from D.O.T. approved 3/16 (5mm) military grade cast acrylic. The windshield comes complete with hardware for an easy but sturdy 4 point mount to the handlebar clamps and the headlight bolts. The bottom width of 19.5 inches tapering to 16 inches at the top of the screen provides a substantial envelope of still air provided you get the correct size windshield for your height. The screen is offered in 3 heights to accommodate riders of all statures.